Today Pre-school invited their parents into school to watch their class assembly. 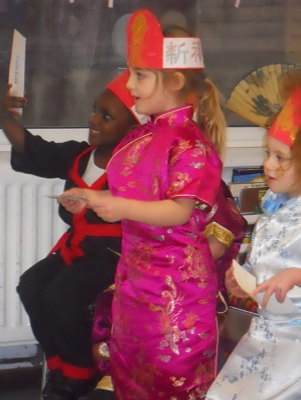 It was a very special as the children have been celebrating the Year of the Pig in their Chinese New Year preparations. The children dressed up in Chinese costumes and the boys formed a dragon. They performed the dragon dance while the girls played Chinese musical sounds using shakers and other musical Instruments. We finished our assembly with a song ‘Kung Hei Fat Choi’ meaning Happy Chinese New Year. Special thanks to Mrs White and Mr Reid for helping at the assembly and decorating the hall beautifully with lanterns and other hanging decorations. 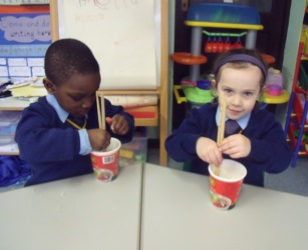 To compliment the theme this week the children have been eating noodles with chopsticks and have tried other Chinese foods.